Published: Sep 30, 2016 to ? One day, a girl was kidnapped. However, that girl started to desire a life living with her captor, and swears that she will marry him. In return, her captor provides her with happiness that she had always longed for. How could a story between a girl and her captor be so heart warming? Basically...every manga where we have a stalker trying to get his 'girl' turns out to be total s*it. I wanted to read this manga with the same mentality..." Oh hell yea, found a manga which I know is gonna be s*it. WOHOO...IMMA write a s*it review for this..." Well...I was wrong as hell...the manga centers around the girl who was being stalked...not the stalker. The kidnapped girl living happily with her kidnapper...not seen that much? Although it is really cliched manga...it feels like you are pretty much living your own life with them. After the first few chapters...one can be like, "Oh, this manga looks pretty bad...why not drop it?" No! don't drop it...I mean it's your wish. To me personally, this manga was something that...not everyone will like ...but has some potential to turn into a mind blowing manga. I know this review was pretty s*it...coz' it was my first review...wohoo! This manga does not really depict a case of the Stockholm Syndrome. Below contains some spoilers to explain why this manga isn't depicting a case of the Stockholm Syndrome, which would understandably put many people off. If you don't want to see any spoilers go to TLDR. The girls life has been bad; So bad that she get's abused by her parents at home, her teacher and her fellow students at school. She doesn't even have a lot common sense, such as the knowledge on the existence of a pause function on videos online due to her circumstances. Being "Kidnapped" meant she is more happy than when she was not kidnapped. And this isn't even proper kidnapping. The girl can probably run away at anytime; she isn't confined to a room, nor is she chained. The "kidnapper" is kind to her, cooks her meals, let's her watch TV and even takes her out sometimes. Moreover when you hear the word "kidnapping", you'll probably think of a person forcefully shoving another person in the back of a truck. This was not how she was kidnapped. In other words, this isn't proper kidnapping so don't get a preconceived idea that this is a manga depicting a case of Stockholm Syndrome since this manga doesn't actually show it. A real case of the Stockholm Syndrome is a lot more messed up. What this manga actually shows is someone showing kindness to a girl that has had a really unfortunate life and this girl finally experience what happiness is. Throughout the manga you learn more about the girls circumstances and a tiny glimpse into the life of the kidnapper, though it's still mostly shrouded in mystery. We see that their relationship is a complicated one, with both of them having their fair share of troubles. In summary, just see this manga as a slice of life manga about a girl experiencing happiness for the first time in her life from someone, meanwhile the manga delves deeper into their circumstances. The true value of this series lies within the complexity of the characters. It is a very psychological work. First I would like to address two issues. First, people have an issue with the age gap between the two main characters, but I feel like this case deserves a special, unbiased outlook. Second, this is not a depiction of Stockholm Syndrome: this isn't really a kidnapping. It's more like she ran away from home and he is taking care of her. Additionally, I would not even consider it to be romantic. The idea of them even "liking" each other is very questionable. As of chapter 27, their relationship is fully platonic, almost like friends or siblings, which ties back to the age issue. This is a story about two damaged people who are trying to grasp a meaning and reason to life. Through their interactions, they start to save each other and change. They are both damaged, lonely, and conflicted but have quite opposite views (one who didn't necessarily want to die but believed suicide was the best option and the other who wants to die but can't bring themself to commit suicide). As the story continues, their facades start to fall away and they really turn out to be opposite of what they're introduced as. This development and their inner conflict is really what shines. I believe that the characters are beautifully crafted, the story is somewhat interesting, and the art is great. I'm no expert in psychology, but from experience, I can say that the human mind is a complicated thing full of contradictions, twisted logic, and conflict. It's very difficult to put in words but the characters' thoughts were just relatable and made sense to me. Simply put, I enjoyed it. Like Sachi narrates, their relationship wouldn't easily be understood by the public. 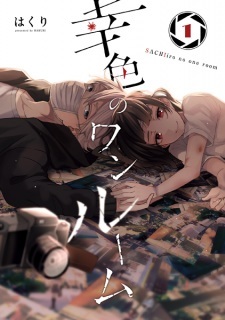 This manga is probably not targeted towards the general public, but rather an audience who either relates with the experiences/thoughts of the characters or is interested in the psychological genre. i got curious because i read a tweet that the live action drama series was cancelled on some parts of kanto region because the plot is controversial. after reading the first few chapters, this manga is problematic in so many levels. the heroine is a 14 yr old girl while her stalker/kidnapper is a 26 yr old man. BUT OHMYGOD! the way the author/mangaka wrote this is really spectacular. if the leads are all of legal age and don't have a big age gap, many would like this story. i know that it is not right to romanticize it but set it aside and read it objectively and then judge the manga.